One can only take so many giant robots fighting each other. If you want to watch giant robots fighting each other you should definitely see “Pacific Rim: Uprising.” Don’t see it if you actually thought the 2013 film “Pacific Rim” was really great and you're expecting more of the same. This somewhat long-delayed sequel certainly isn’t worth the wait, and everything that worked the first time just doesn’t work this second time around. The fun, colorful look of Guillermo del Toro’s film are gone, replaced by drab hues; the exciting battles of monster vs machine are replaced with generic fights of machine vs machine; and some of the interesting characters we got to know and love are replaced by ill-advised character turns or replaced altogether. Which basically means that this is an incredibly inferior follow-up. “Pacific Rim: Uprising” takes place about a decade after the events of the first film. If you remember, giant alien monsters were transporting themselves from another dimension through a rift in the Pacific Ocean. Humans built gigantic, two person piloted mechanic robots called “Jaegers” to fight the devastating creatures. And at the end of the film the rift was successfully blown to bits, making these giant “Kaijus” unable to attempt to destroy Earth. 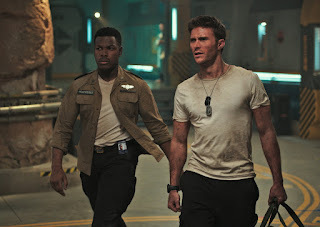 This time, the troubled son of Idris Elba’s character from the first film and former Jaeger pilot Jake Pentecost (John Boyega) is arrested and forced to trade is time for returning to help train bland, new Jaeger pilots. A orpaned teenage girl named Amara (Cailee Spaeny) also figures into the plot but she feels somewhat shoehorned in. Rinko Kikuchi returns as Jake’s adopted sister who also works for Pan Pacific Defense Corps. The Jaeger trainees are forced to suit up when a corporation’s Jaeger drone program takes off and the drones begin to go rogue. Yawn. It’s Always Sunny’s Charlie Day shows up again as the comic relief but his character is used for a different purpose this time and it just doesn’t work. And playing the role of handsome, generic white guy is Scott Eastwood. Hollywood, stop trying to make Scott Eastwood happen. It’s not gonna happen. And finally Kaijus show up in the third act and yet again threaten to destroy the entire planet. There was a something really great about “Pacific Rim” that worked. Maybe it was the lack of expectation? It was a highly stylized action film inspired by Japanese monster movies. Del Toro, who recently won an Oscar for directing “The Shape of Water” has a visual eye rarely seen in big budget blockbuster films. His movies look great and sort of… weird. Everything is “normalized” in “Pacific Rim: Uprising” thanks Steven S. DeKnight who makes his directorial debut. The cinematography is fine but unremarkable. There’s not real distinct “look.” The performances from the admittedly diverse cast are fine for a genre film but the characters are unmemorable. Even the music score isn’t all that catchy until Ramin Djawadi’s theme from the first film finally kicks in at one point. The final battle scene is well staged and somewhat exciting, but everything leading up to it is hardly remarkable.